Part of the reason for this gap is that many Hispanics, particularly those that work in low wage jobs, don't have access to retirement plans, said Monique Morrissey, an economist at the EPI who analyzed data from the Federal Reserve for the report. Immigrant Hispanic workers, for example, are often more likely to be undocumented and therefore working off the books or work in low wage jobs that don't offer access to retirement accounts, Morrissey said. Native-born Hispanics, however, are more likely to have access to and participate in retirement accounts at rates closer to those of African-Americans, Morrissey said. 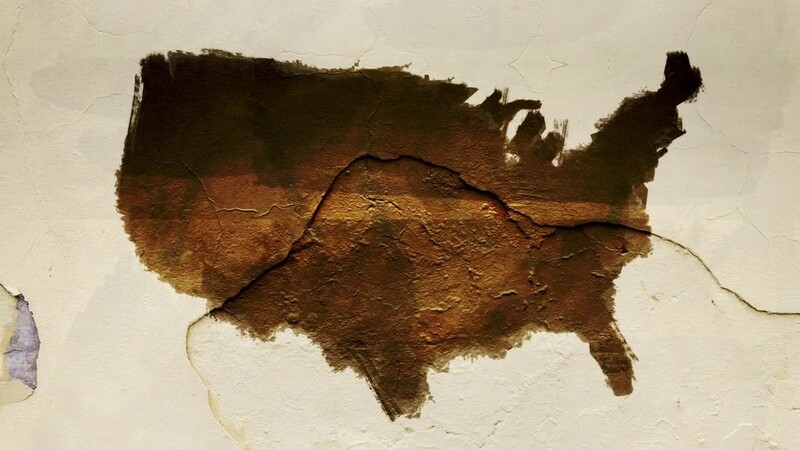 "Most whites are not doing well, blacks and Hispanics are doing terrible and immigrant Hispanics are doing the worst of all when it comes to retirement savings," Morrissey said. Low rates of participation also contribute to low rates of retirement savings. In 2013, white workers between the ages of 32 and 61 had an average of $125,000 in retirement savings compared to $26,500 for blacks and $16,800 for Hispanics. For Asians and those of other races or ethnicities, the average retirement savings in 2013 was $100,000. "[The] savings in these accounts magnify income inequality," Morrissey said. 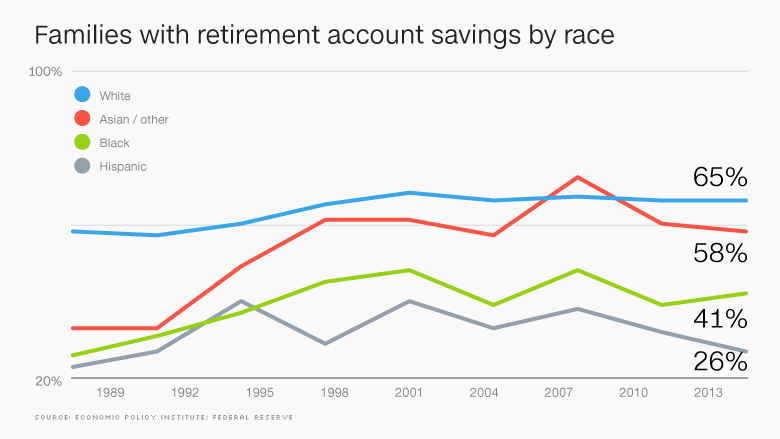 The retirement savings gap also closely mirrors the overall racial wealth gap in America. Wealth, or net worth, is the value of assets including your home, retirement savings and income minus the debt owed against those assets. According to federal data, the median wealth for white families in 2013 was around $141,900, compared to Hispanics at about $13,700 and blacks at about $11,000. For Morrissey, the trends are troubling. Initially, plans like 401(k)s and IRAs supplemented pension accounts or provided an alternative for employees who did not have access to a pension, Morrissey said. But since the 1990s, they have become the main source of retirement savings for many private sector workers. And since many employers have begun matching less of their employees' contributions, more of the savings burden has been placed on employees. Access is another issue. Hispanics and blacks often work for small businesses and in low-wage, non-union jobs that offer few retirement savings options, Morrissey said. The overall number of public sector jobs with secure pensions, which were often considered a clear path into the middle class, has also been on the decline. That has only served to widen the gap. At least two-thirds of all of the wealth in 401(k) accounts is concentrated among the top 20% of earners, Morrissey said. Those who get paid more "can afford to put in more, they can afford to invest in higher return assets, they are more likely to have more generous employee matches," she said. As a result, many Hispanics rely on Social Security as their sole financial support in retirement, a move that experts say puts many workers in a precarious situation. Since Hispanics are more likely to live longer than blacks and whites, they are also more likely to work longer into their old age, Morrissey said. Some Hispanic workers "are going to work longer, and they are going to rely on their families and they are going to be poor," she said. Undocumented workers who may not be using their own Social Security card to qualify for employment and for tax purposes will also see little, if any, of the Social Security benefits they accrue over the years, Morrissey said. "We have that huge swath of the demographic that is underprepared and underfunded and Social Security is not going to be enough," said Ramona Ortega, founder of Mi Dinero Mi Futuro (My Money My Future), a financial technology company that helps Hispanic millennials manage their money. When they do have access to employer retirement plans, Hispanic workers generally don't contribute as much to those plans "either because they can't afford it or because they don't understand it," Ortega said. Hispanics are also less likely to buy life insurance and more likely to borrow against their 401(k), she added. They are also more likely to rely on family for financial support. While that provides a certain amount of security and stability, it can also come at a cost for younger family members. That's why millennial Hispanics are Ortega's focus. "We don't think about financial planning because we are in survival mode," Ortega said. Young Hispanics need to start saving for retirement much earlier, Ortega said. They also need to think about estate planning, buying insurance and watching their credit. Doing so, she said, can help prevent "a financial emergency from becoming a financial crisis."